A guitar capo is something most guitarists can’t live without. It allows us to easily raise or lower the pitch of our instrument to fit a particular key. 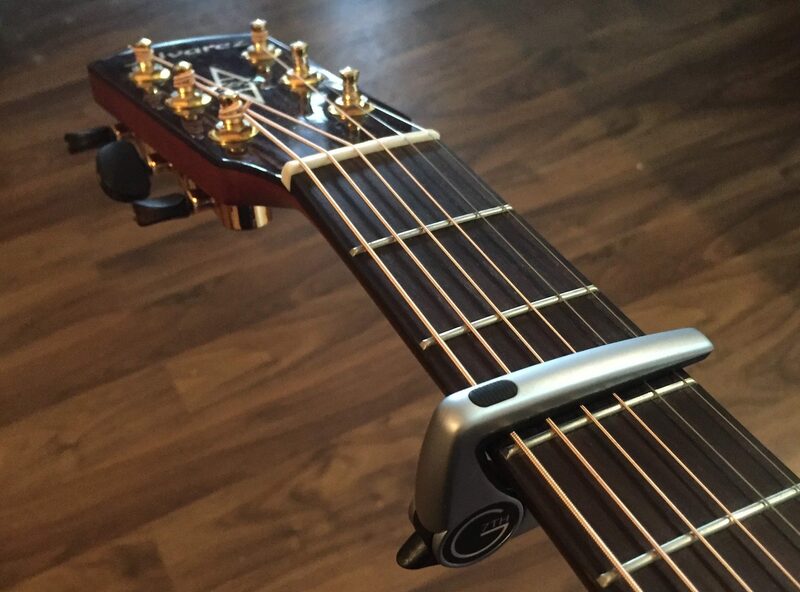 I’ve written an article about capos in the past – What Is a Capo – however, this post is all about reviewing one of the best capos I’ve used – the G7th Performance 2 capo. G7th is a capo company based in England and founded in 2004. They strongly commit to being entirely focussed on their capos’ design and quality so much so that they don’t even (currently) produce any other guitar-related products – just capos. This commitment however has paid off by winning them awards and having their capos used by a range of well-known musicians around the world. 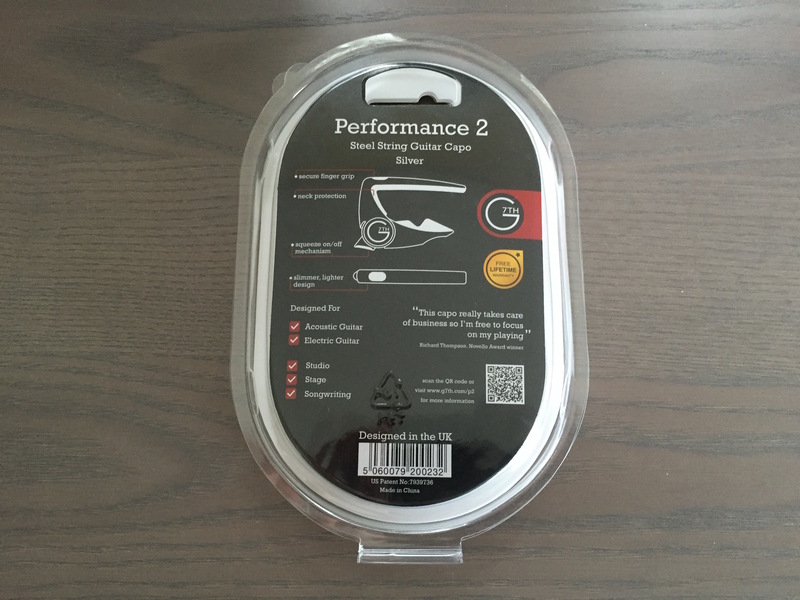 I got my hands on one of their newest capo models, the Performance 2 capo. In this G7th capo review post I’ll share my thoughts about this capo, how it compares to a traditional capo, and more. Upon first receiving the G7th Performance capo, I initially read the front and back of the packaging. Something I wasn’t aware of about this capo is that it actually comes with a lifetime warranty. You simply just need to activate your warranty through their website. Here are a couple of pictures of the packaging it came in. Upon taking the capo out of the packaging the first thing that really stood out was its size. I’ve been a long time user of trigger style capos which are a fair bit bulkier than the G7th Performance 2 model. When I held it in my hand it was very lightweight but did not feel cheap. I tried out the release mechanism (which was completely new to me) and it seemed to work well. One thing I was wary of however was how well this capo would actually press down the strings on my guitar. It’s unlike a trigger capo where once you squeeze to open the capo you can feel the tension. 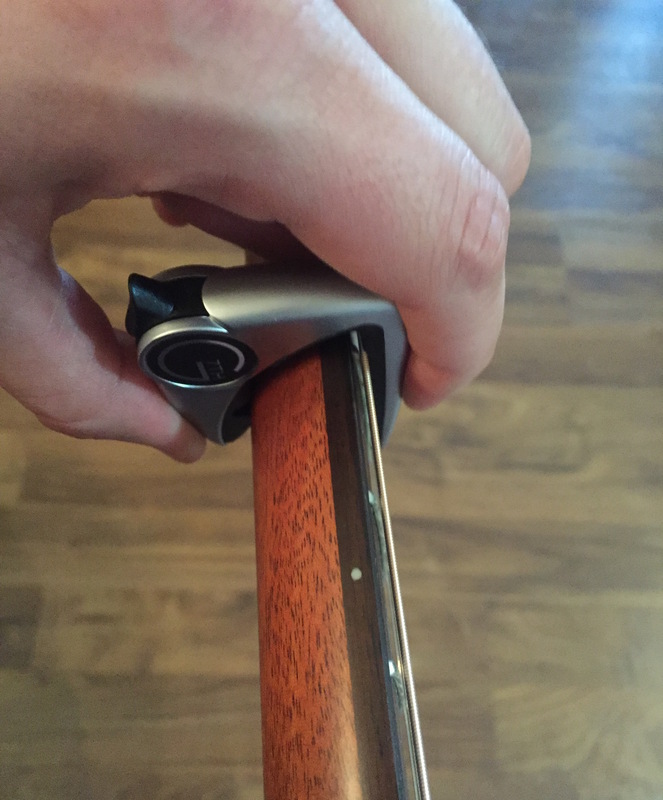 The Performance 2 capo doesn’t feel like it creates tension at all when you open / close it. So, I was anxious to try it out on my acoustic guitar. Upon placing the capo on a particular fret you simply need to squeeze the capo that it will press down on all the strings (just like a barre chord). I must admit, at first I wasn’t sure how hard I should be squeezing and it took me a couple of tries before being able to accurately place the capo on a fret and pluck all the strings without hearing any ringing. However, this has nothing to do with the capo itself, more likely just the fact that I wasn’t used to it yet. It might take a couple of tries to get it right but you’ll catch on quick. Once I got the hang of it, I fell in love with it. The release mechanism is super easy to operate with one hand and you can quickly change from fret to fret. 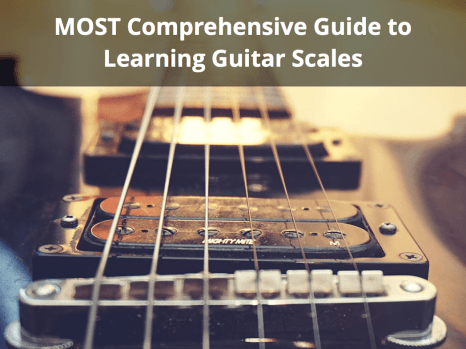 Additionally, once you get a feel for how hard you need to squeeze the capo in order for it press down all the strings, you shouldn’t hear any ringing strings no matter which fret you apply the capo to. Overall, my first impressions were very positive. The capo has a great design (which I’ll discuss more below), it’s minimalistic and works great. As I mentioned, I’m a long time user of a trigger capo, specifically a Jim Dunlop trigger capo. Why, you might ask? No particular reason, they work good, you can change positions quickly, and they’re pretty inexpensive. Many beginner guitarists usually end up using a trigger capo for these reasons. However, when I compared it to the G7th performance 2 capo I saw a few key differences. When it comes to the size differences there is really no comparison. While my old Jim Dunlop capo is thick, bulky, and quite frankly a bit awkward looking, the Performance 2 capo is thin sleek, and barely noticeable. Here is a side-by-side comparison of my trigger capo next to the G7th capo. As far as usability goes, the G7th performance 2 capo is just as straightforward and easy to use as a traditional capo. I wouldn’t say that you’re able to change frets any faster than using a trigger capo, however timing should be about on-par. I would also add that the release mechanism on the G7th capo is much easier to use than a trigger or spring loaded capo. 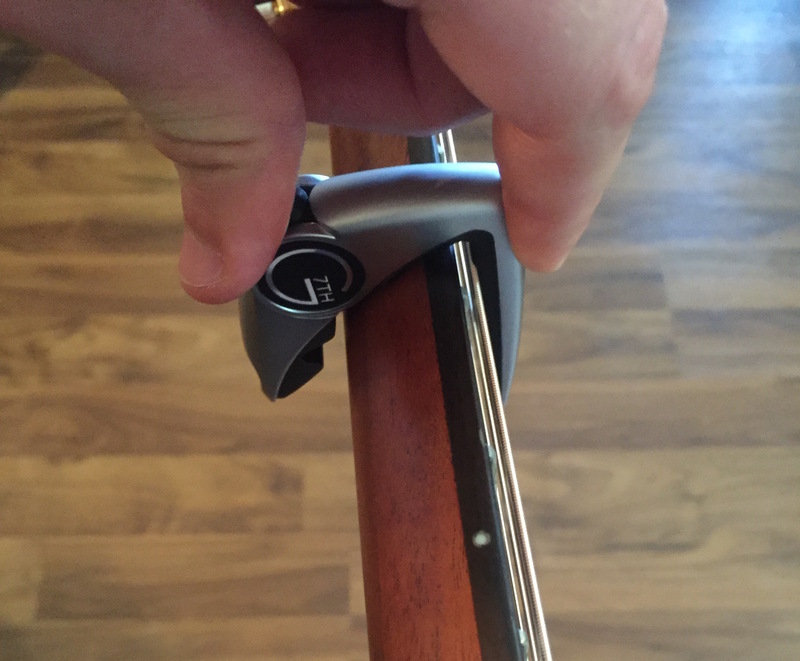 You barely need to press down on the release button with your thumb in order for the capo to open. On the other hand, with many capo alternatives, you need to squeeze the capo handles with much more force in order to release them. The quality of this capo feels quite solid. There aren’t many moving pieces, meaning there’s less chance of a piece breaking or being defective. The rubber pads that press against the guitar strings and the back of the guitar’s neck are made of silicon rubber. This type of rubber won’t affect the finish of your guitar whereas some types of materials used in other brands of capos may actually pull pieces of the finish off. I wanted to also address the capo’s unique design. As you have probably noticed, it looks considerably different than most other types of capos. The twin-peak design which comes in contact with the back of the guitar neck is to create even pressure across the strings wherever you place the capo. A closer look at the release mechanism shows that it’s quite simple and easy to operate. Additionally, as previously mentioned, the slim design allows you to place it on your guitar and not have it stand out. One thing that also bothered me with my trigger capo is that I didn’t feel comfortable attaching it to my headstock and then placing my guitar in its case. This is because the capo would actually touch the bottom of the case before the cases’s neck support would touch the neck of the guitar. This made me worried about creating unwanted upward tension on the headstock on my guitar. With the Performance 2’s low profile however, I’m able to attach it to my headstock without it coming close to touching the bottom of the guitar case. I thought I’d include a few other images I took of the G7th Performance 2 capo to help further highlight its design and functionality. Improved release mechanism – The release mechanism for the Performance 2 capo has been significantly improved. The placement now makes it much easier to remove the capo from your guitar’s fretboard using only one hand. Slimmer design – The Performance 2 capo is 25% smaller than the original model. Making it less noticeable and bulky. Lighter – The Performance 2 capo is also 33% lighter than the original. This is a great improvement if you are a Performance 1 owner and notice that the capo is a bit heavy. I personally have never tried the G7th Performance 1 capo and am not sure if they even manufacture it anymore. However, if you are an owner of the Performance 1 model, you may want to consider giving the G7th Performance 2 capo a try as a few key improvements have been made. Overall, I’ve really enjoyed using the G7th Performance 2 capo so far. In my opinion, it is probably the best capo currently on the market. As I mentioned a few times, it’s lightweight, minimalistic, sleek, and works great. There is a bit of a learning curve when first using the capo to determine how hard you should actually press, however, it becomes second nature after a few tries. The price point of the G7th Performance 2 capo is higher than other entry-level capos out there. However, I do truly believe it is worth the cost. The fact that it feels quite durable and won’t harm the finish of your guitar are two huge pluses in my books. Additionally, it comes with a lifetime warranty in the event that you experience a manufacturer’s defect with the capo itself. I would certainly recommend this capo to any guitarist who is on the hunt for their first capo or looking to upgrade their existing one. If you’d like more information about this capo, I’ve included a couple of additional links in the section below. Let me know in the comments section if you have any questions about the G7th Performance 2 capo and what you think the best capo is. Additionally, if you own one of these capos yourself, I would love to hear what you think about them. 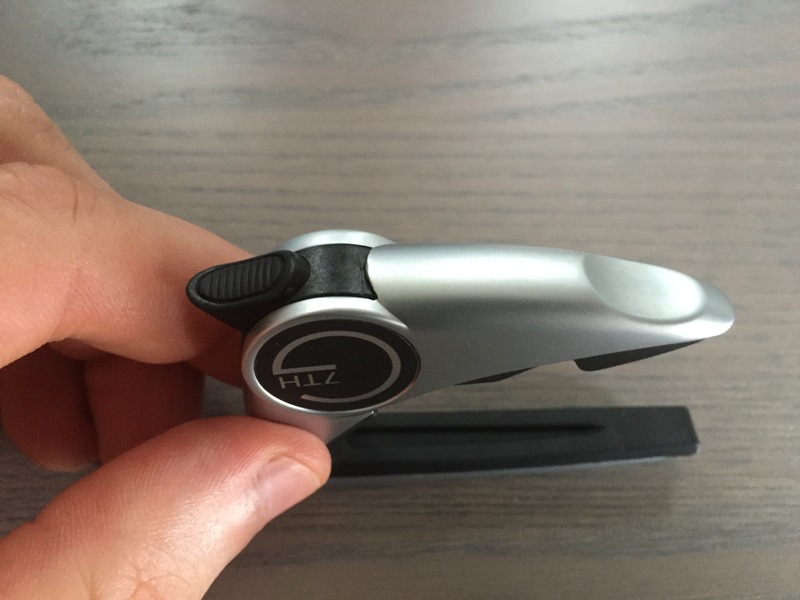 The G7th Performance 2 capo is, in my opinion, one of the best capos currently on the market. Everything from its ease-of-use, quality materials, and sleek design, I know I will be using it for many years. Although it is more expensive than other brands of capos, as a guitarist I believe it is worth the investment.